Wow! That was a bit of a break! Sorry for that everyone, but the Gearcast is finally back! This time talking about capturing genre fiction in your game! Join me and special guest and lead editor of Mu: Age of Adventure, Cat as we discuss your favorite cheap novels and how they translate to gaming! The GearStream! …well, not just yet. Hey everyone! Nick here again. So Wednesdays are going to switch over to the GearStream for some chat on games, game design, and chill time running through some of my favorites as well as test sessions of Mu and anything else that might be in the pipe! But my equipment isn’t quite up to the task this week, so come back next week for the official launch of the GearStream! Wednesdays at 9pm PST. Mu: Age of Adventure — A look at the mim! Hey everyone, Nick here again! Back to Mondays as usual, this time with a look at one of the four playable species in Mu — the Mim. Small in stature and almost resembling woolen haired dolls with large eyes, broad noses, and big fuzzy round ears, the mim are native to the temperate foothills and forested plains of the central northern continent. Their hair ranges from dark black to bright white, with a light greyish being the most common coloration. Most mim are somewhat pale in skin tone with darker noses, but very dark almost coal colored mim, while rare, do exist. Unlike humans, mim exhibit very little sexual dimorphism, with both the men and women being equal in size and stature. The women tend to have slightly rounder facial features and less curly hair, while the men have exceptionally thick and woollen curls. Politically the mim are a small but motivated group who have seized some of the biggest opportunities in trade that have occurred in the last century on Mu. While many small independent “nations” exist on the fringes of mim territory, these are more often than not protectorates of the Central Mim Kingdom which holds court in the capital city of Frimble. It was the previous king, the illustrious Angbar VI, who used the influx of money and goods from the founding of Tradewind to transform the relatively small city into a cultural juggernaut. For the past 50 years the city of Frimble has seen great leaps and bounds in the realms of the arts and philosophy. Angbar VI imported artisans, scholars, and all manner of cultural ambassadors in great droves to his city using the wealth he gained from his father’s trade options power play. Most notably was the elevation of the arts to a lofty status in the culture, which sired a complex and stratified social order in mim society that has taken strong root. Men are expected to study art, philosophy and science, and further the understanding of the culture. It then falls to women to perform the tasks seen as effete and unmanly – such as cooking, cleaning, fighting, and adventuring. The most manly of the arts is high fashion, with the current trend being one of of ostentation and elegance. The most famous designers, wig makers, and tailors all come from Frimble and their works fetch exorbitant prices the world over. In the larger adventuring world however, they have become very popular recently among the other intelligent species for their unique brands of cultural magic that allow them to preserve food, purify drink, and repair cloth. A walking, talking, ship’s repair kit and refrigerator will always find employ on trade voyages and many have taken to vying for positions on the extremely well funded expedition voyages many of the current nations have been putting together. Not to mention the welcoming arms of those on the other side of the kings’ notes in this time of burgeoning piracy. The most unusual thing however, combined with their strange appearance, is their proclivity for the magical arts. Mim mages and hedge wizards seem unnaturally gifted, and although theirs is a magic derived from culture and society, they show alarming attunement with any magical task put before them. Some anthropologists and archeologists have hypothesised the mim might be an engineered species, as they have yet to find any artifacts dating back before the age of wizardry, but that debate is currently ongoing in the halls of Mu academia. And that’s a bit of an intro for the mim! 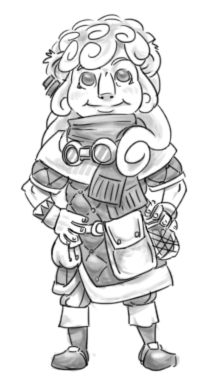 Their size and appearance leads them to often be treated with kid gloves, much to their chagrin, but they are an important part of the Mu adventuring landscape! Hey everyone, Nick here! Sorry things have been so slow. Updates will resume as normal next week, but for today I’d like to briefly discuss perhaps one of the most important bits of background history for Mu — the Age of Wizardry. Tens of thousands of years before the current Age of Adventure that has settled on Mu, a great number of powerful wizards lived. Humans who had discovered the secrets to the powers the gods themselves wielded and styled themselves the rulers of the world. And for a time they were. This Age of Wizardry lasted for close on fifteen thousand years, but the human mind wasn’t meant to contain the gods’ power. It took only a couple hundred years for the minds of these nearly omnipotent individuals to degenerate into fevered obsession and neurosis. For the next several millennia they stayed locked in their own minds, controlled by whatever flight of fancy or stray compulsion made its way to the forefront of their thoughts. Dungeons, artifacts, creatures, a veritable cornucopia of strange and dangerous creations they made over the years. The wizards went from the undisputed masters of Mu to distant, reclusive feudal lords in only a couple generations, but their experiments and creations changed the face of the world for thousands of years. As their minds slowly left them, so did their power and eventually, as their inevitable demise dawned on them, they sought to stash away what they had done. They would keep their precious inventions, pets, servants, and baubles to themselves – forever. So they sealed away their creations. Their houses, laboratories, dungeons and factories were locked up, shifted outside of time and space, held inside the foam on the Sea of Possibilities that exists just beyond what mere mortals can comprehend. There, inside these pocket realities would their creations live in stasis, forever unchanging, forever outside the reach of the rabble and diminutive beings of Mu who could never understand them. Or so they thought. Finally, insanity consumed their minds and bodies. All that they were, all they thought they would ever be, eroded by the very powers they were certain would keep them as gods for all time. Such was their hubris and trespass on the fabric of reality, that as their lights extinguished all memory of who they were was scrubbed from the universe itself. No one remembers their names, faces, personalities, or motivations. All that remains are the scars of their inventions. Inventions that they hoped would remain locked away forever. But as with any living being, foreign bodies illicit an immune response. Mu has been slowly working to unravel the locks and seals on these magical splinters that have been wedged into it, in the hopes that the creatures upon its surface could clean out these infections. During the Age of Quiet that preceded the current Age of Adventure, a small handful of these dungeons were unlocked and opened; aired out purged by the early predecessor of the modern adventurer. At the dawn of the current Age however, the flood gates have been opened and that which was locked away has surged back into the world. The Age of Wizardry was a strange, unknowable time that created things that can make perfect sense or no sense at all. When designing dungeons from the Age of Wizardry the themes of obsession, master craftsmanship, and rampant creativity should be at the forefront. Physics, biology, and even the fabric of time and space take a back seat to the uncontained creativity the wizards of old drowned themselves in. Returning from a rather unfortunate and unforeseen absence, we’re back with some background to the central city of Mu! This update comes to you from our lead world historian, Ian Auger. Hi, my name is Ian, and I’m the Senior World Engineer/Contracted Word Monkey here at Gearheart Games. Nick asked me to put together some blog posts on the world of Mu: Age of Adventure to introduce you all to the game’s world. Without further ado, allow me to present the centerpiece of the setting: the city of Tradewind. Eighty years ago, four ships sailed into the harbor of Dellaporta. The banners flying on the tall masts both raised a celebration and sent riders from the gates of the city — the Ninette Expedition had returned. Named after the Mim explorer leading the small fleet, the expedition was a joint venture between the kings of Frimble and Lichlen, seeking a second route into the heart of the southern continent. The city-states of the Pelakos League had long controlled the overland routes from the southern shore of the Sea of Voyage into the heart of the continent and therefore had a monopoly on the lucrative trade in spices and silken fabrics flowing out of it. Ancient records mentioned passages through the mountains lining the continent’s western edge, however, and armed with records dating back to the Empire, Ninette had ventured forth in search of a route that would bypass the League’s hold on the inside of the continent. On her return, however, she brought back more than just a map laying out a new trade route. The expedition had taken rock samples as they made their way across the newly named Ninevene Mountains, and assays taken on the voyage home revealed that they held traces of iron, copper, and more importantly, gold. Riches lay along the route to the Great Swamp as well as in it, enough to radically change the balance of power along the shores of the Sea of Voyages, and the two kings deliberated over what to do with the bounty they’d been handed. Between them, they could exploit the treasures they’d found, but holding them for long would be difficult, especially should the League unite or possibly even ally with one of their neighbors to dislodge them. Inviting leaders of the other nations formed out of the fall of the Pelagian Empire, they instead proposed a compact — extracting the wealth would take people, equipment, and money, and all those who contributed could share in the rewards. In order to ensure equitable distribution, goods flowing from the south would come through one port, a city governed by the signers of the compact. The signing of what would come to be known as the Tradewind Accords by Lichlen, Frimble, Avellais, Pelagos, and the Craglands changed the face of Dellaporta forever. The city that had launched and received the Ninette Expedition would become the city that received the bounty it had unlocked. Since the signing of the accords 75 years ago, the port has exploded in population, attracting workers, artisans, merchants, artists, and adventurers from across the five nations signing to the treaty. Belonging to all of the Accord nations, but a part of none, Tradewind offered the possibility of a new life, either in the city itself, or in the burgeoning colonies on the Ninevene coast. It is a cosmopolitan city, with vast markets selling seemingly everything to be had in the world, narrow cobble streets on which a dozen languages are spoken, and opulent villas built by the city’s new monied elites springing up on seemingly a daily basis. Examine the city a little closer, and the peaceful, prosperous aura fades. Tradewind has rapidly become the center of the world for mercenaries and adventurers, two groups that rarely leave peace in their wakes. Both ship out from Tradewind to troubled spots across the two continents, and both bring trouble home with their gold when they return. While the Adventurer’s Guild and Mercenary Board attempt to keep their unruly members in line, they only sometimes succeed. While the Five Nations — six, now that Lichlen has been consumed by civil war for nearly a decade — are officially at peace and the Accords guarantee a share of the riches, that has never stopped them from trying to undercut each other for a larger share of the wealth. Their representatives on the council are at each others’ throats as often as they’re in agreement, and their disputes boil out equally onto the ballroom floor and the shadows of the market streets. In the midst of all this, however, the people of Tradewind grow and prosper. Nearly four generations after the founding, more and more people are proud to style themselves Tradewinders. And now I’ll turn this back over to Nick! Many thanks to Ian! Look forward to more of his writing and setting as we continue to bring Mu: Age of Adventure to life! Mu: Age of Adventure –_Beta_1.0! Sorry, sorry! Things aren’t flowing as smoothly as expected! Beta rules delayed until Wednesday! See you then!